Twenty-seven years after Paul Verhoeven's "Robocop", José Padilha's same-titled film arrives today. Times have changed since 1987. Drones are the American way. Surveillance and technology is pervasive. Three wars have occupied U.S. armed forces. 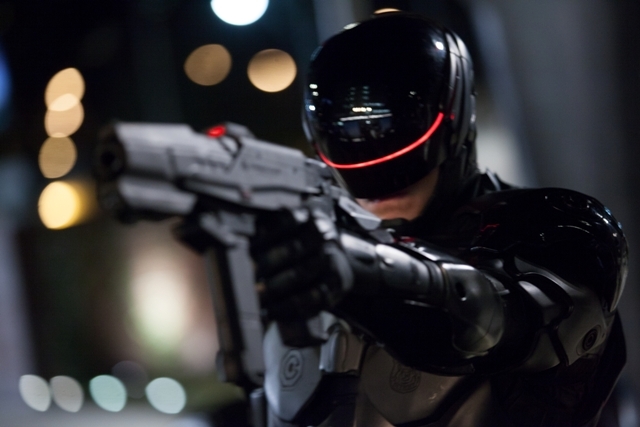 September attacks Robocop couldn't have ever stopped devastated parts of America. And Detroit, as a city, is literally bankrupt. The Detroit of Mr. Padilha's "Robocop" appears strangely unaffected economically yet crime remains an issue. What better way to put crime to sleep than bringing Robocop to the city's corrupt police department? OmniCorp president Raymond Sellars (Michael Keaton) has won the backing of the U.S. public and his made-in-China Robocop comes to America with instant results, championed by bombastic Fox News-type conservative primetime TV personality Pat Novak (Samuel L. Jackson). DPD officer Alex Murphy (Joel Kinnaman) is bent on solving an undercover buy-and-bust operation gone wrong but will himself go undercover as the new RoboCop after an attempt on his life. The 2028 Robocop, now clad in sleek black armor thanks to OmniCorp's compassionate Dr. Norton (Gary Oldman), is more in touch with his feelings than his weaponry. Sometimes. The emotional tenor of "RoboCop" is partly in Swedish actor Kinnaman's face, which carries -- forgive me -- a certain neutrality. A prolonged shot of Alex Murphy's exposed lungs and brain dangling, an unnerving sight among a few grisly moments for a PG-13 film, also, strangely enough, give this formulaic meat-and potatoes film its emotive kernels. That lingering shot seeps into the heart. "Robocop" is an average film made entertaining due to Mr. Jackson's reliable presence. He's the showstopper-in-chief, and Mr. Padilha, who directed the excellent documentary "Bus 174" among other films, takes every advantage of Mr. Jackson's larger-than-life iconic status. Novak's ideologue populist outrage is pure satire and reactionary riposte. Mr. Jackson keeps "RoboCop" afloat with Novak's exhortations and is immensely funny at times. The villainy is relatively tin-pot though both Jay Baruchel and Jennifer Ehle are engaging but aren't on screen nearly enough. Mr. Keaton wore Beetlejuice pants in 1988, a year prior to becoming The Caped Crusader, but as the nominal bad guy he doesn't get much in gear in "RoboCop". As a CEO every line Mr. Keaton speaks suggests a "been there, done that" jadedness. The script by Joshua Zetumer (based on Edward Neumeier and Michael Miner's 1987 screenplay) is thin. Lines given to Alex's wife Clara (Abbie Cornish) like "I can't do this by myself," on keeping her small family intact when her husband's crime-fighting overwhlems, rings somewhat hollow and is questionable, especially when many single mothers in Detroit manage well enough. At other times, such as a lazy opening salvo staged in Iran, which makes its antagonists look pathetic, also seems expedient. Still, Mr. Padilha crafts a functional film, one finds time to have fun with itself and its original predecessor. It's a warmer, more people-friendly film than Mr. Verhoeven's stark, coolly ruthless and violent R-rated powerhouse. In 2028 RoboCop is to its time what the iPhone is to today. It's the new craze. With his softer center this RoboCop gets the job done without shooting first and asking questions later. There are no daddy issues, no Kryptonite, no complexes or other assorted Achilles heels. Ultimately RoboCop charts his own course. He's an entourage of one. Also with: Michael K. Williams, Jackie Earle Haley, Marianne Jean-Baptiste. "RoboCop" is rated PG-13 by the Motion Picture Association Of America for intense sequences of action including frenetic gun violence throughout, brief strong language, sensuality and some drug material. The film's running time is one hour and 48 minutes.